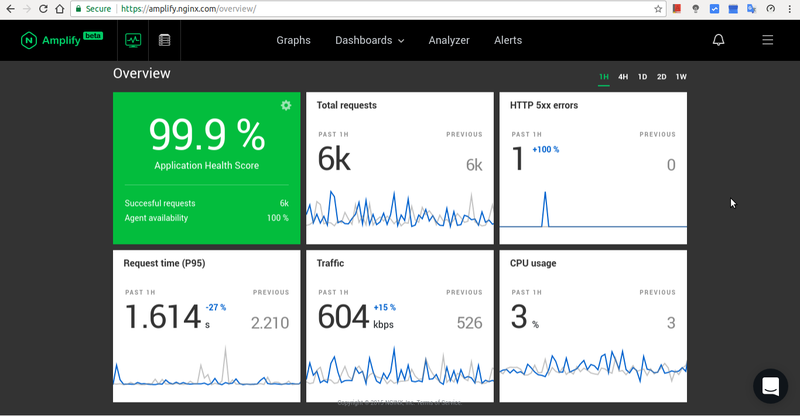 Nginx Amplify is my new found extensive Nginx monitoring and metrics, with general server metrics included. This article will walk you through how to install and start monitoring in under 2 minutes! Every request coming through my server goes through Nginx, thus such a one-stop-shop for metrics and monitoring related to Nginx is just so timely and useful for me. Remember that all commands in this article are to be issued on your remote server. If you don’t have Nginx on your server, then this might not be the monitoring and metrics gathering tool you’re looking for. Make sure to restart the amplify-agentjust after installation. I had issues without restart. By default, you might not have the stub_status enabled in your Nginx configuration anywhere. So we need to configure that. Be sure to include contents of the /etc/nginx/conf.d/* folder in your main nginx.conf file. Run $ nginx -t to check the nginx configuration if working fine and there are no errors. Now give your Nginx Amplify Dashboard some time to start seeing some metrics showing. We’ll enable the rest in a jiffy. However, you should start seeing some metrics when you change to the 1H time interval for the graphs. As you wait for the Dashboard to populate the metrics it pulls at 1-minute intervals, you can check if your stub_status is working as expected. If something like the above shows, then you have your stub_status working. 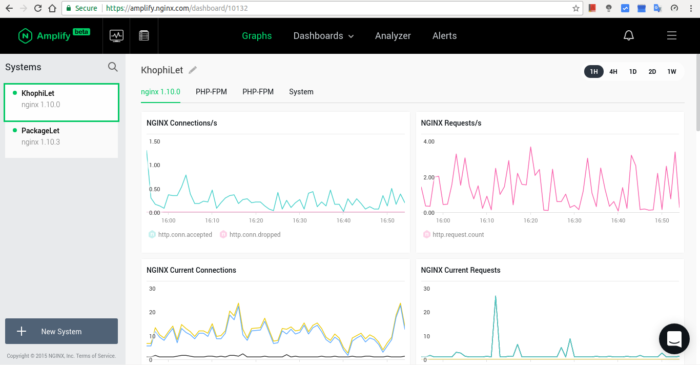 ‘NGINX Amplify can collect a number of additional useful metrics which will be added to the Graphs page if the agent finds additional metrics. With the required log format configuration, you’ll be able to build more specific custom graphs. Now with the main_ext variable, we need to apply that to the access.log of our Nginx configurations. As we wait for the recent changes to start populating on our Nginx Amplify Dashboard, let’s move on to rig our php-fpm to also send in some metrics. If you run a WordPress instance, you very likely have php-fpm running on the system. We need metrics from this process too, and here we wanna configure that. On my box, I’m using PHP7.1. You can confirm what version you’re using by checking your Nginx configurations related to fastcgi and notice the PHP sock it is connected to. pm.status_path is set. If not set, it usually looks like this: pm.status_path = /status. If it exist but commented, please uncomment it. With all of the above successfully configured, the end result should be an additional tab displayed on the Graphs page, with the pre-defined visualization of the PHP-FPM metrics. If you see two PHP-FPM tabs, then you very likely have 2 PHP-FPM instances running on your system (as shown in video below), although only one might be used for all your applications. I always try to stay latest, thus with all my PHP-related applications i.e WordPress, inheriting from one single include nginx conf file, all I do is point the sock file to the most recent PHP instance. Automatically all my PHP-apps switch to using the latest PHP-FPM of the latest PHP. Restart the agent one last time, and let the fun begin! You should end up with something similar to what was shown in the early part of this article. I’m personally enjoying this Amplify platform from Nginx. Nginx has been my go-to front-end server for almost all things, including even for MongoDB. It works, is fast, and lean! All my personal and client projects are served with Nginx. The Amplify platform is a welcome addition and works amazingly. I hope this article got you started with Nginx Amplify. Hope you see you in the next one.